Religion in India is characterized by a diversity of religious beliefs and practices. India is the birthplace of four of the world's major religions; namely Hinduism, Buddhism, Jainism and Sikhism. Throughout India's history, religion has been an important part of the country's culture. Religious diversity and religious tolerance are both established in the country by the law and custom. According to the 2001 census, 80.5% of the population of India practice Hinduism. Islam (13.4%), Christianity (2.3%), Sikhism (1.9%), Buddhism (0.8%) and Jainism (0.4%) are the other major religions followed by the people of India. There are also numerous minor tribal traditions, though these have been affected by major religions such as Hinduism, Buddhism, Islam and Christianity. The diversity in the religious belief systems of India today, is a result of both the existence of many native religions and also, the assimilation and social integration of religions brought to the region by travelers, immigrants, traders, and even invaders and conquerors such as the Mughals. Zoroastrianism and Judaism also have an ancient history in India, and each has several thousands of Indian adherents. India has the largest population of people adhering to Zoroastrianism (i.e. Parsis and Iranis) and Bahá'í Faith in the world, even though these religions are not native to India. Many other world religions also have a relationship with Indian spirituality, such as the Baha'i faith which recognises Buddha and Krishna as manifestations of the God Almighty. The Indian diaspora in the West has popularised many aspects of Hare Krishna movement, the Brahma Kumaris, the Ananda Marga, and others have spread Indian spiritual beliefs and practices. The Muslim population of India is the third largest in the world. India also has the third largest Shia population in the world and being the cradle of the Ahmadiyya Islam, it is one of very few countries in the world with at least 1 million Ahmadi Muslims. The shrines of some of the most famous saints of Sufism, like Moinuddin Chishti and Nizamuddin Auliya, are found in India, and attract visitors from all over the world. India is also home to some of the most famous monuments of Islamic architecture, such as the Taj Mahal and the Qutb Minar. Civil matters related to the community are dealt with by the Muslim Personal Law, and constitutional amendments in 1985 established its primacy in family matters. The Constitution of India declares the nation to be a secular republic that must uphold the right of citizens to freely worship and propagate any or no religion or faith. The Constitution of India also declares the right to freedom of religion to be a fundamental right. Evidence attesting to prehistoric religion in the Indian "subcontinent" derives from scattered Mesolithic rock paintings depicting dances and rituals. Neolithic pastoralists inhabiting the Indus Valley buried their dead in a manner suggestive of spiritual practices that incorporated notions of an afterlife and belief in magic. Other South Asian Stone Age sites, such as the Bhimbetka rock shelters in central Madhya Pradesh and the Kupgal petroglyphs of eastern Karnataka, contain rock art portraying religious rites and evidence of possible ritualized music. 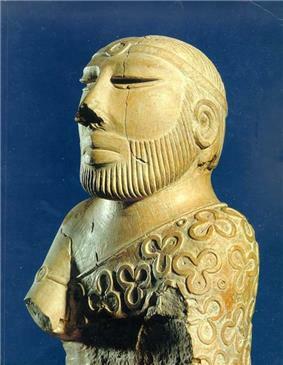 The Harappan people of the Indus Valley Civilisation, which lasted from 3300 to 1400 BCE and was centered on the Indus and Ghaggar-Hakra river valleys, may have worshiped an important mother goddess symbolizing fertility. Excavations of Indus Valley Civilisation sites show seals with animals and "fire‑altars", indicating rituals associated with fire. A linga-yoni of a type similar to that which is now worshiped by Hindus has also been found. Hinduism is often regarded as the oldest religion in the world, with roots tracing back to prehistoric times, over 5,000 years ago. Over time, Brahmanism gradually became Hinduism. Hinduism spread through parts of Southeastern Asia, China, Korea, and Japan. Hindus worship a single god with different forms. 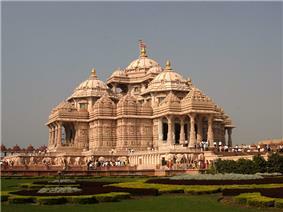 Akshardham, largest Hindu temple in the world. Hinduism's origins include the cultural elements of the Indus Valley Civilisation along with other Indian civilisations. The oldest surviving text of Hinduism is the Rigveda, produced during the Vedic period and dating to 1700–1100 BCE.γ[›] During the Epic and Puranic periods, the earliest versions of the epic poems, in their current form including Ramayana and Mahabharata were written roughly from 500–100 BCE, although these were orally transmitted through families for centuries prior to this period. After 200 BCE, several schools of thought were formally codified in the Indian philosophy, including Samkhya, Yoga, Nyaya, Vaisheshika, Purva-Mimamsa and Vedanta. Hinduism, otherwise a highly theistic religion, hosted atheistic schools and atheistic philosophies. Other Indian philosophies generally regarded as orthodox include Samkhya and Mimamsa. Mahavira the 24th Jain Tirthankara (599–527 BCE), stressed five vows, including ahimsa (non-violence) and asteya (non-stealing). Gautama Buddha, who founded Buddhism, was born to the Shakya clan just before Magadha (which lasted from 546–324 BCE) rose to power. His family was native to the plains of Lumbini, in what is now southern Nepal. Indian Buddhism peaked during the reign of Ashoka the Great of the Mauryan Empire, who patronised Buddhism following his conversion and unified the Indian subcontinent in the 3rd century BCE. He sent missionaries abroad, allowing Buddhism to spread across Asia. Indian Buddhism declined following the loss of royal patronage offered by the Kushan Empire and such kingdoms as Magadha and Kosala. Some scholars think Hinduism expanded between 400 CE and 1000 CE, as the decline of Buddhism in India continued. During the 14–17th centuries, when North India was under Muslim rule, the Bhakti movement swept through Central and Northern India. The Bhakti movement was initiated by a loosely associated group of teachers, or sants. Chaitanya Mahaprabhu, Vallabhacharya, Surdas, Meera Bai, Kabir, Tulsidas, Ravidas, Namdeo, Tukaram and other mystics were some of the sants in the North. They taught that people could cast aside the heavy burdens of ritual and caste, and the subtle complexities of philosophy, and simply express their overwhelming love for God. This period was also characterised by an abundance of devotional literature in vernacular prose and poetry in the ethnic languages of the various Indian states or provinces. The Bhakti movement gave rise to several different movements throughout India. During the Bhakti movement, many Hindu groups regarded as outside the traditional Hindu caste system followed Bhakti traditions by worshipping/following saints belonging to their respective communities. For example, Guru Ravidas was a Chamar of Uttar Pradesh; Guru Parsuram Ramnami was a Chura of Chhatisgarh; and Maharishi Ram Naval was a Bhangi of Rajasthan. In their lifetimes, several of these saints even went to the extent of fighting conversion from foreign missionaries, encouraging only Hinduism within their communities. In Assam for example, tribals were led by Gurudev Kalicharan Bramha of the Brahmo Samaj; in Nagaland by Kacha Naga; and in Central India by Birsa Munda, Hanuman Oaron, Jatra Bhagat and Budhu Bhagat. Guru Nanak (1469–1539) was the founder of Sikhism. The Guru Granth Sahib was first compiled by the fifth Sikh guru, Guru Arjan Dev, from the writings of the first five Sikh gurus and others saints who preached the concept of universal brotherhood, including those of the Hindu and Muslim faith. Before the death of Guru Gobind Singh, the Guru Granth Sahib was declared the eternal guru. Sikhism recognises all humans as equal before Waheguru, regardless of color, caste or lineage. Sikhism rejects the beliefs of idol worship and circumcision. 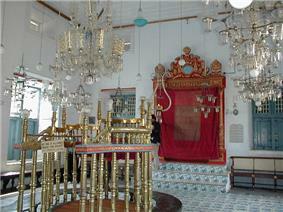 Jews first arrived as traders from Judea in the city of Kochi, Kerala, in 562 BCE. More Jews came as exiles from Israel in the year 70 CE, after the destruction of the Second Temple. The works of scholars and Eastern Christian writings say that Christianity was introduced to India by Thomas the Apostle, who visited Muziris in Kerala in 52 CE and baptised Kerala's Jewish settlements, who are known as Saint Thomas Christians (also known as Syrian Christians or Nasrani) today. Although the exact origins of Christianity in India remain unclear, there is a general scholarly consensus that Christianity was rooted in India by the 3rd century AD, including some communities who used Syriac liturgically, and it is a possibility that the religion's existence in India extends to as far back as the 1st century. Christianity in India has different denominations, like Roman Catholicism, Oriental Orthodox, and Protestantism. Most Christians reside in South India, particularly in Kerala, Tamil Nadu and Goa. There are also large Christian populations in the North-east Indian states. Christianity in India was expanded in the 16th Century by Catholic Portuguese expeditions and by Protestant British and American missionaries in the 18th century. 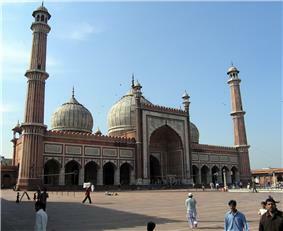 The Jama Masjid in Delhi is one of the world's largest mosques. Though Islam came to India in the early 7th century with the advent of Arab traders, it started to become a major religion during the Muslim conquest in the Indian subcontinent. Islam's spread in India mostly took place under the Delhi Sultanate (1206–1526) and the Mughal Empire (1526–1858), greatly aided by the mystic Sufi tradition. As of 2011, there were about 177 Million Muslims in India, comprising 14,6% of the total population. Communalism has played a key role in shaping the religious history of modern India. As an adverse result of the British Raj's divide and rule policy, British India was partitioned along religious lines into two states—the Muslim-majority Dominion of Pakistan (comprising what is now the Islamic Republic of Pakistan and the People's Republic of Bangladesh) and the Hindu-majority Union of India (later the Republic of India). The 1947 Partition of India led to rioting amongst Hindus, Muslims, and Sikhs in Punjab, Bengal, Delhi, and other parts of India; 500,000 died as a result of the violence. The twelve million refugees that moved between the newly founded nations of India and Pakistan composed one of the largest mass migrations in modern history.Δ[›] Since its independence, India has periodically witnessed large-scale violence sparked by underlying tensions between sections of its majority Hindu and minority Muslim communities. The Republic of India is secular; its government recognises no official religion. Hinduism is an ancient religion (although Hinduism is diverse, with monotheism, henotheism, polytheism, panentheism, pantheism, monism, atheism, agnosticism, and gnosticism being represented), and Hinduism is also the largest religious grouping in India; its more than 1 billion adherents (2001) compose 80.5% of the population. The term Hindu, originally a geographical description, derives from the Sanskrit, Sindhu, (the historical appellation for the Indus River), and refers to a person from the land of the river Sindhu. 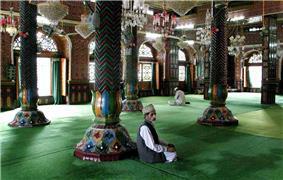 Muslims praying in a mosque in Srinagar, Jammu and Kashmir. Islam is a monotheistic religion centered on the belief in one God and following the example of Muhammad; It is the largest minority religion in India. According to the 2001 census, India is home to 138 million Muslims, the world's third-largest Muslim population after those in Indonesia (210 million) and Pakistan (166 million). Muslims compose 13.4% of the Indian population. Muslims are a majority in states Jammu and Kashmir and Lakshadweep, and live in high concentrations in Andhra Pradesh, Uttar Pradesh, Bihar, West Bengal, Assam, and Kerala. There has been no particular census conducted in India with regards to sects, but sources suggest the largest denomination is Sunni Islam with a substantial minority of Shiite Muslims and Ahmadi Muslims. Indian sources like Times of India and DNA reported the Indian Shiite population in mid-2005–2006 to be between 25% and 31% of entire Muslim population of India, which accounts them in numbers between 40 to 50 million of a total of 157 million Muslims in India. 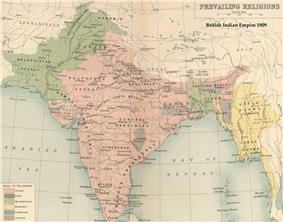 Map of the British Indian Empire in 1909, shaded by prevailing religion. Christianity is a monotheistic religion centred on the life and teachings of Jesus as presented in the New Testament. It is the third largest religion of India, making up 2.3% of the population. St. Thomas is credited with introduction of Christianity in India. He arrived in Malabar Coast in 52 CE. Christians comprise a majority in Nagaland, Mizoram, and Meghalaya and have significant populations in Kerala and Goa. Prayer flags above the buddhist monastery (gompa) of Tanze, in the Kurgiakh Valley. 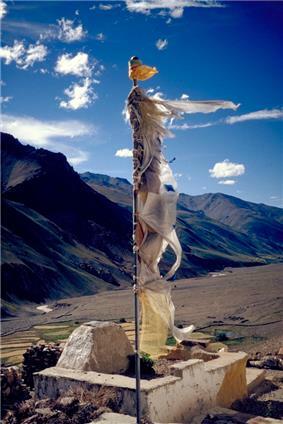 The wind is believed to propagate prayers printed on the flags. Buddhism is an Indian, nontheistic religion and philosophy. Around 8 million Buddhists live in India, about 0.8% of the population. Jainism is a non-theistic Indian religion and philosophical system originating in Iron Age India. Jains compose 0.4% (around 4.2 million) of India's population, and are concentrated in the states of Gujarat, Karnataka, Maharashtra, and Rajasthan. Although Jainism is usually believed to be atheistic/non-theistic, Paul Dundas writes, "While Jainism is, as we have seen, atheist in the limited sense of rejection of a creator god and the possibility of the intervention of such a being in human affairs, it nonetheless must be regarded as a theist religion in the more profound sense that it accepts the existence of a divine principle, the parmatman, often in fact referred to as 'God' (e.g. ParPr 114-16), existing in potential state within all beings". Paul Dundas writes that most British judges of the 19th century "had no doubts about the independent nature and origin of Jainism". In 1847, one judge wrote that religious minorities like Jains, Parsis, and Sikhs "Had nothing or next to nothing in common with brahmanical worship". Another judge noted in 1874 that Jains could not be subject to Hindu law because "the term Hindoos means persons within the purview of the shastras, which shastras are at the bottom of Hindu law. If a person is out of that purview, Hindoo law cannot be applied to him" He does note, "the earliest censuses of India suggest that many Jains and members of other religious groups saw themselves as in fact constituting varieties of Hinduism and, according to the Census Report for the Punjab of 1921, 'in view of the unwillingness of large number of Jains and Sikhs to be classed separately from Hindus, permission was given to record such persons as Jain-Hindus and Sikh-Hindus". He does recognise the "preconceptions of the census enumerators" influenced the census. Furthermore he adds the term "Jain-hindu" was an 'unhappy and artificial compromise". 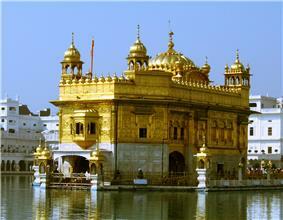 Sikhism began in sixteenth century North India with the teachings of Nanak and nine successive human gurus. As of 2001, there were 19.2 million Sikhs in India. Punjab is the spiritual home of Sikhs, and is the only state in India where Sikhs form a majority. There are also significant populations of Sikhs in neighbouring Delhi and Haryana, both of which were historically part of Punjab. As of the census of 2001, Parsis (followers of Zoroastrianism in India) represent approximately 0.006% of the total population of India, with relatively high concentrations in and around the city of Mumbai. Parsis number around 61,000 in India. There are several tribal religions in India, such as Donyi-Polo. Santhal is also one of the many tribal religions followed by the Santhal people who number around 4 million but only around 23,645 follow the religion. About 2.2 million people in India follow the Bahá'í Faith, thus forming the largest community of Bahá'ís in the world. 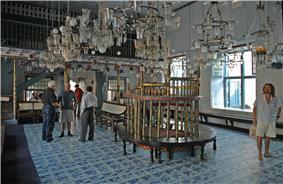 The interior of the Paradesi Synagogue in Cochin. Judaism is also present in India, a monotheistic religion from the Levant. There is today a very small community of Indian Jews. There were more Jews in India historically, including the Cochin Jews of Kerala, the Bene Israel of Maharashtra, and the Baghdadi Jews near Mumbai. In addition, since independence two primarily proselyte Indian Jewish communities in India: the Bnei Menashe of Mizoram and Manipur, and the Bene Ephraim, also called Telugu Jews. Of the approximately 95,000 Jews of Indian origin, fewer than 20,000 remain in India. Some parts of India are especially popular with Israelis, swelling local Jewish populations seasonally. Around 0.07% of the people did not state their religion in the 2001 census. There are six religions in India which have been awarded "National minority" status- Muslims, Christians, Sikhs, Jains, Buddhists and Parsis. Some analysts expect the proportion of Hindus to fall below 80% of the population in the 2011 census, mainly due to the lower birth rate and higher child mortality amongst Hindus compared to India's Muslim population. Though followed by a minor portion of the Indian population, irreligion (including atheists, agnostics, and humanists) has a strong tradition in India. Atheism has historically been propounded within the Hindu philosophy. Followers usually like to call themselves Hindu atheists. The preamble to the Constitution of India proclaims India a "sovereign socialist secular democratic republic". The word secular was inserted into the Preamble by the Forty-second Amendment Act of 1976. It mandates equal treatment and tolerance of all religions. India does not have an official state religion; it enshrines the right to practise, preach, and propagate any religion. No religious instruction is imparted in government-supported schools. In S. R. Bommai vs. Union of India, the Supreme Court of India held that secularism was an integral tenet of the Constitution. Freedom of religion is a fundamental right according to the Indian Constitution. The Constitution also suggests a uniform civil code for its citizens as a Directive Principle. This has not been implemented until now as Directive Principles are Constitutionally unenforceable. The Supreme Court has further held that the enactment of a uniform civil code all at once may be counter-productive to the unity of the nation, and only a gradual progressive change should be brought about (Pannalal Bansilal v State of Andhra Pradesh, 1996). In Maharishi Avadesh v Union of India (1994) the Supreme Court dismissed a petition seeking a writ of mandamus against the government to introduce a common civil code, and thus laid the responsibility of its introduction on the legislature. Major religious communities not based in India continue to be governed by their own personal laws. Whilst Muslims, Christians, Zoroastrians, and Jews have personal laws exclusive to themselves; Hindus, Jains, Buddhists and Sikhs are governed by a single personal law known as Hindu personal law. Article 25 (2)(b) of the Constitution of India states that references to Hindus include "persons professing the Sikh, Jain or Buddhist religion". Furthermore the Hindu Marriage Act of 1955 defines the legal status of Jains, Buddhists and Sikhs as legal Hindus but not "Hindus by religion". The only Indian religion exclusively covered under the secular ("civil") law of India is Brahmoism starting from Act III of 1872. Religion plays a major role in the Indian way of life. Rituals, worship, and other religious activities are very prominent in an individual's daily life; it is also a principal organiser of social life. The degree of religiosity varies amongst individuals; in recent decades, religious orthodoxy and observances have become less common in Indian society, particularly amongst young urban-dwellers. 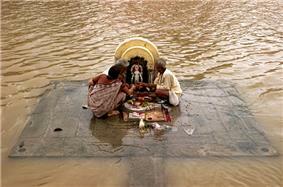 A puja performed on the banks of the overflowing Shipra River in Ujjain during the summer monsoon. The vast majority of Indians engage in religious rituals on a daily basis. Most Hindus observe religious rituals at home. Observation of rituals vary greatly amongst regions, villages, and individuals. Devout Hindus perform daily chores such as worshiping puja, fire sacrifice called Yajna at the dawn after bathing (usually at a family shrine, and typically includes lighting a lamp and offering foods before the images of deities), recitation from religious scripts like Vedas, Puranas singing hymns in praise of gods etc. A notable feature in religious ritual is the division between purity and pollution. Religious acts presuppose some degree of impurity, or defilement for the practitioner, which must be overcome, or neutralised, before or during ritual procedures. Purification, usually with water, is thus a typical feature of most religious action. Other characteristics include a belief in the efficacy of sacrifice and concept of merit, gained through the performance of charity or good works, that will accumulate over time and reduce sufferings in the next world. Devout Muslims offer five daily prayers at specific times of the day, indicated by adhan (call to prayer) from the local mosques. Before offering prayers, they must ritually clean themselves by performing wudu, which involves washing parts of the body that are generally exposed to dirt or dust. A recent study by the Sachar Committee found that 3–4% of Muslim children study in madrasas (Islamic schools). 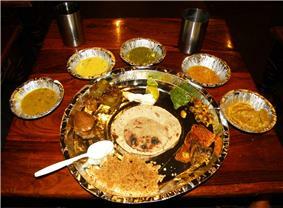 A vegetarian thali from Rajasthan. Dietary habits are significantly influenced by religion. Almost one-third of Indians practice lacto-vegetarianism; it came to prominence during the rule of Emperor Ashoka of the Maurya Empire, a promoter of Buddhism. Vegetarianism is much less common amongst Sikhs and almost uncommon amongst Muslims, Christians, Bahá'ís, Parsis and Jews. Jainism requires monks and laity, from all its sects and traditions, to be vegetarian. Furthermore, the religion also bars jains from eating any vegetable that involves digging it from the ground. This rule, therefore, excludes potatoes, sweet potatoes, carrots, garlic, peanuts, raddish etc. from Jain diet. Islam and Judaism bar pork. Occasions like birth, marriage, and death involve what are often elaborate sets of religious customs. In Hinduism, major life-cycle rituals include annaprashan (a baby's first intake of solid food), upanayanam ("sacred thread ceremony" undergone by upper-caste youths), and shraadh (paying homage to a deceased individual). According to the findings of a 1995 national research paper, for most people in India, a betrothal of a young couple placing an expectation upon an exact date and time of a future wedding was a matter decided by the parents in consultation with astrologers. A significant reduction in the proportion of arranged marriages has however taken place since 1995, reflecting an incremental change. Muslims practise a series of life-cycle rituals that differ from those of Hindus, Jains, and Buddhists. Several rituals mark the first days of life—including whispering call to prayer, first bath, and shaving of the head. Religious instruction begins early. Male circumcision usually takes place after birth; in some families, it may be delayed until after the onset of puberty. Marriage requires a payment by the husband to the wife and the solemnization of a marital contract in a social gathering. On the third day after burial of the dead, friends and relatives gather to console the bereaved, read and recite the Quran, and pray for the soul of the deceased. Indian Islam is distinguished by the emphasis it places on shrines commemorating great Sufi saints. 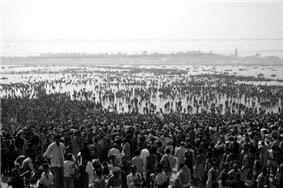 The largest religious gathering ever held on Earth, the 2001 Maha Kumbh Mela held in Prayag attracted around 70 million Hindus from around India. Many Hindu families have their own family patron deity or the Kuladaivat. This deity is common to a lineage or a clan of several families who are connected to each other through a common ancestor. The Khandoba of Jejuri is an example of a Kuladaivat of some Maharashtrian families; he is a common Kuladaivat to several castes ranging from Brahmins to Dalits. The practice of worshiping local or territorial deities as Kuladaivats began in the period of the Yadava dynasty. Other family deities of the people of Maharashtra are Bhavani of Tuljapur, Mahalaxmi of Kolhapur, Renuka of Mahur, and Balaji of Tirupati. Maramon Convention, the largest annual Christian gathering in Asia, organised by the Mar Thoma Church. 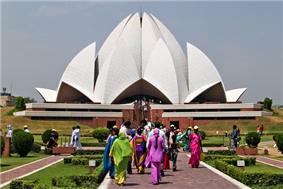 India hosts numerous pilgrimage sites belonging to many religions. Hindus worldwide recognise several Indian holy cities, including Allahabad, Haridwar, Varanasi, Ujjain, Rameshwaram and Vrindavan. Notable temple cities include Puri, which hosts a major Jagannath temple and Rath Yatra celebration; Tirumala - Tirupati, home to the Tirumala Venkateswara Temple; and Katra, home to the Vaishno Devi temple. The Himalayan towns of Badrinath, Kedarnath, Gangotri, and Yamunotri compose the Char Dham (four abodes) pilgrimage circuit. The Kumbh Mela (the "pitcher festival") is one of the holiest of Hindu pilgrimages that is held every four years; the location is rotated amongst Allahabad, Haridwar, Nashik, and Ujjain. The Thalaimaippathi at Swamithope is the leading pilgrim center for the Ayyavazhis. Amongst the Eight Great Places of Buddhism, seven are in India. 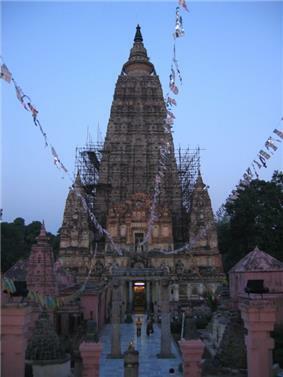 Bodh Gaya, Sarnath and Kushinagar are the places where important events in the life of Gautama Buddha took place. Sanchi hosts a Buddhist stupa erected by the emperor Ashoka. Several Tibetan Buddhist sites in the Himalayan foothills of India have been built, such as Rumtek Monastery and Dharamsala. For Muslims, the Dargah Shareef of Khwaza Moinuddin Chishti in Ajmer is a major pilgrimage site. Other Islamic pilgrimages include those to the Tomb of Sheikh Salim Chishti in Fatehpur Sikri, Jama Masjid in Delhi, and to Haji Ali Dargah in Mumbai. Dilwara Temples in Mount Abu, Palitana, Pavapuri, Girnar and Shravanabelagola are notable pilgrimage sites (tirtha) in Jainism. The Harmandir Sahib in Amritsar is the most sacred gurdwara of Sikhism, while the Lotus Temple in Delhi is a prominent house of worship of the Bahá'í faith. Hinduism contains many different sub-cultures just like most other religions. The major aspects outlined above hold true for the majority of the Hindu population, but not all. Just as each state is home to an individual language, Hinduism harbors various sub-cultures whose traditions may or may not be shared by other Indians. A sect from Gujarat called the Prajapatis for example, hold water as the sacred ornament to every meal. Before and after a meal, an individual is expected to pour water in the palms of their right hand and sip the water three times. This is often seen as a purification gesture: food is regarded as being holy and every individual must purify themselves before touching their food. Other minor sects in India carry no specific name, but they are uniquely identified by the last names of each family. This convention is used more frequently in South India than North India. For example, a relatively prominent sect in southern India prohibits making important decisions, commencing new tasks, and doing other intellectually or spiritually engaged actions after sunset. Historians believe that this tradition was derived from the concept of Rahukaalam, in which Hindus believe that a specific time period of the day is inauspicious. Stringent family beliefs are thought to have led to the development of a more constrained religious hierarchy. Over time, this belief was extended to discourage taking major actions and even staying awake for long periods of time after sunset. Examples of families which follow this tradition include Gudivada, Padalapalli, Pantham, and Kashyap. Takht Sri Hazur Sahib, Nanded, built over the place where Guru Gobind Singh was cremated in 1708, the inner chamber is still called Angitha Sahib. Religious ideology, particularly that expressed by the Hindutva movement, has strongly influenced Indian politics in the last quarter of the 20th century. Many of the elements underlying India's casteism and communalism originated during the rule of the British Raj, particularly after the late 19th century; the authorities and others often politicised religion. The Indian Councils Act 1909 (widely known as the Morley-Minto Reforms Act), which established separate Hindu and Muslim electorates for the Imperial Legislature and provincial councils, was particularly divisive. It was blamed for increasing tensions between the two communities. Due to the high degree of oppression faced by the lower castes, the Constitution of India included provisions for affirmative action for certain sections of Indian society. Many states ruled by the Bharatiya Janata Party (BJP) introduced laws that made conversion more difficult; they assert that such conversions are often forced or allured. The BJP, a national political party, also gained widespread media attention after its leaders associated themselves with the Ram Janmabhoomi movement and other prominent religious issues. A well known accusation that Indian political parties make for their rivals is that they play vote bank politics, meaning give political support to issues for the sole purpose of gaining the votes of members of a particular community. Both the Congress Party and the BJP have been accused of exploiting the people by indulging in vote bank politics. The Shah Bano case, a divorce lawsuit, generated much controversy when the Congress was accused of appeasing the Muslim orthodoxy by bringing in a parliamentary amendment to negate the Supreme Court's decision. After the 2002 Gujarat violence, there were allegations of political parties indulging in vote bank politics. During an election campaign in Uttar Pradesh, the BJP released an inflammatory CD targeting Muslims. This was condemned by the Communist Party of India (Marxist) as playing the worst kind of vote bank politics. Caste-based politics is also important in India; caste-based discrimination and the reservation system continue to be major issues that are hotly debated. Several political parties have been accused of using their political power to manipulate educational content in a revisionist manner. During the Janata Party government (1977–1979), the government was accused of being too sympathetic to the Muslim viewpoint. In 2002, the BJP-led NDA government tried to change the National Council of Educational Research and Training (NCERT) school textbooks through a new National Curriculum Framework. Some media referred to it as the "saffronisation" of textbooks, saffron being the color of BJP flag. The next government, formed by the UPA and led by the Congress Party, pledged to de-saffronise textbooks. Hindu groups alleged that the UPA promoted Marxist and pro-Muslim biases in school curricula. India is the home and birthplace of four major religions: Hinduism, Buddhism, Jainism, and Sikhism," and also the home to Judaism and Christianity. All of these religions were passed down over time, not with the help of immigrants. Most people see India as being strongly based upon Hinduism, however Hinduism cannot be characterized as a religion. Millions of people in India have been taught through heritages, that Hinduism is a philosophy. "Hindu" for many Persians and Arabs was not considered a religious word but as a geographical and cultural one, used to describe the land next to the Indus River. 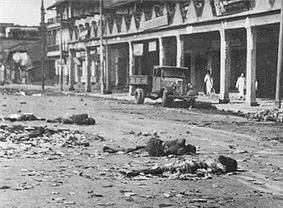 Aftermath of Hindu-Muslim clashes in Calcutta following the 1946 Direct Action Day. Communal conflicts have periodically plagued India since it became independent in 1947. The roots of such strife lie largely in the underlying tensions between sections of its majority Hindu and minority Muslim communities, which emerged under the Raj and during the bloody Partition of India. Such conflict also stems from the competing ideologies of Hindu fundamentalism versus Islamic fundamentalism and Islamism; both are prevalent in parts of the Hindu and Muslim populations. This issue has plagued India since before independence. The lack of education among the masses and the ease with which corrupt politicians can take advantage of the same has been attributed as the major reason for religious conflicts in India. Even though Freedom of religion is an integral part of the India constitution, the inability to hold communal mob's accountable has limited the exercise of religious freedom in India. Alongside other major Indian independence leaders, Mahatma Gandhi and his shanti sainiks ("peace soldiers") worked to quell early outbreaks of religious conflict in Bengal, including riots in Calcutta (now in West Bengal) and Noakhali District (in modern-day Bangladesh) that accompanied Muhammad Ali Jinnah's Direct Action Day, which was launched on 16 August 1946. These conflicts, waged largely with rocks and knives and accompanied by widespread looting and arson, were crude affairs. Explosives and firearms, which are rarely found in India, were far less likely to be used. 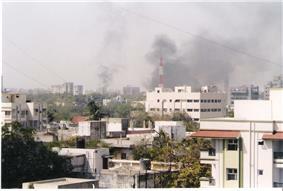 Many of Ahmedabad's buildings were set on fire during the 2002 Gujarat violence. Major post-independence communal conflicts include the 1984 Anti-Sikh riots, which followed Operation Blue Star by the Indian Army; heavy artillery, tanks, and helicopters were employed against the Sikh partisans inside the Harmandir Sahib, causing heavy damage to Sikhism's holiest Gurdwara. According to the Indian government estimations, the assault caused the deaths of up to 100 soldiers, 250 militants, and hundreds of civilians. This triggered Government of India reported 20,000 had fled the city, however the PUCL reported "at least" 50,000 displaced persons. The most affected regions were neighbourhoods in  The collusion of political officials in the massacres and the failure to prosecute any killers alienated normal Sikhs and increased support for the Khalistan movement. The Akal Takht, the governing religious body of Sikhism, most definitely considers the killings to be a genocide. Other incidents include the 1992 Bombay Riots that followed the demolition of the Babri Mosque as a result of the Ayodhya debate, and the 2002 Gujarat violence that followed the Godhra Train Burning—in the latter, more than 2,000 Muslims were killed. Terrorist activities such as the 2005 Ram Janmabhoomi attack in Ayodhya, the 2006 Varanasi bombings, the 2006 Jama Masjid explosions, and the 11 July 2006 Mumbai Train Bombings are often blamed on communalism. Lesser incidents plague many towns and villages; representative was the killing of five people in Mau, Uttar Pradesh during Hindu-Muslim rioting, which was triggered by the proposed celebration of a Hindu festival. 1984 Anti Sikh riots Delhi Assassination of Indira Gandhi Government of India reported 2,700 Sikh deaths and 20,000 displaced. PUCL and newspapers report death toll to be 10,000–17,000 and "at least" 50,000 displaced. 2002 Gujarat Riots Gujarat Godhra train burning Per the Government of Gujarat, 1,044 people were killed – 790 Muslims and 254 Hindus. Most independent groups report 200 – 500 killed in these riots,. Police records list 29 dargahs, 20 mosques, 17 temples and three churches as damaged in the months of March and April. ^ α: The data exclude the Mao-Maram, Paomata, and Purul subdivisions of Manipur's Senapati district. ^ γ: Oberlies (1998, p. 155) gives an estimate of 1100 BCE for the youngest hymns in book ten. Estimates for a terminus post quem of the earliest hymns are far more uncertain. Oberlies (p. 158), based on "cumulative evidence", sets a wide range of 1700–1100 BCE. The EIEC (s.v. Indo-Iranian languages, p. 306) gives a range of 1500–1000 BCE. It is certain that the hymns post-date Indo-Iranian separation of ca. 2000 BCE. It cannot be ruled out that archaic elements of the Rigveda go back to only a few generations after this time, but philological estimates tend to date the bulk of the text to the latter half of the second millennium. ^ Δ: According to the most conservative estimates given by Symonds (1950, p. 74), half a million people perished and twelve million became homeless. ^ Smith, Peter (2008). An introduction to the Baha'i faith. ^ Enroth, Ronald (2005). A Guide to New Religious Movements. InterVarsity Press. p. 160. ^ The Constitution of India Art 25–28. Retrieved on 22 April 2007. ^ "The Constitution (Forty-Second Amendment) Act, 1976". Retrieved 2007-04-22. ^ "'"Ancient Indians made 'rock music. BBC News. 19 March 2004. Retrieved 2007-08-07. ^ Fowler 1997, p. 90. 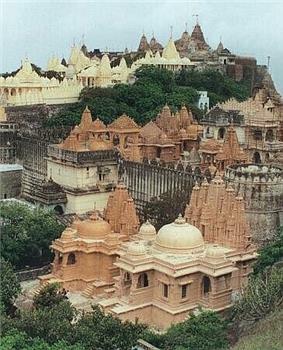 ^ "Largest Hindu temple". guinnessworldrecords.com. ^ "World's largest Hindu Temple". bbc.co.uk. ^ Goldman 2007, p. 23. ^ Rinehart 2004, p. 28. ^ "The rise of Jainism and Buddhism". Religion and Ethics—Hinduism: Other religious influences. BBC. 26 July 2004. Retrieved 2007-04-21. ^ Schreiber, Mordecai (2003). The Shengold Jewish Encyclopedia. Rockville, MD: Schreiber Publishing. p. 125. ^ a b The Encyclopedia of Christianity, Volume 5 by Erwin Fahlbusch. Wm. B. Eerdmans Publishing - 2008. p. 285. ISBN 978-0-8028-2417-2. ^ Medlycott, A E. 1905 "India and the Apostle Thomas"; Gorgias Press LLC; ISBN 1-59333-180-0. ^ Thomas Puthiakunnel, (1973) "Jewish colonies of India paved the way for St. Thomas", The Saint Thomas Christian Encyclopaedia of India, ed. George Menachery, Vol. II. ^ "Kerala Syrian Christians, Apostle in India". nasrani.net. Retrieved 25 October 2009. ^ See Jones, Arun, "Christianity in South Asia" in Farhadian (ed. ), Introducing World Christianity (Blackwell Publishing, 2012), p. 93. For a more thorough treatment of the topic which affirms Jones' claims, and for the use of Syriac, see Frykenberg, Robert Eric, Christianity in India: From Beginnings to the Present (Oxford University Press, 2008). See also the earlier Neill, Stephen, A History of Christianity in India (Cambridge University Press, 1984), pp. 48–49. Neill takes it as certain that Christianity was established in India by the 6th century and also affirms the possibility of the St. Thomas tradition being true. ^ Origin of Christianity in India – A Historiographical Critique by Dr. Benedict Vadakkekara. (2007). ISBN 81-7495-258-6. ^ "Christianity". India Mirror. Retrieved 2008-03-13. ^ "The Story of India". www.bibleforu.com. Retrieved 2008-03-13. ^ "Christianity in India". M.B. Herald, Vol. 35, No. 9. Retrieved 2008-03-13. ^ chandru. "SUFISM IN INDIA: Its origin, history and politics". Southasiaanalysis.org. Retrieved 2011-02-03. ^ "India’s Muslims Growing, and neglected". The Economist. Retrieved 2014-04-16. ^ Symonds 1950, p. 74. ^ Rogers, Peter (2009). Ultimate Truth, Book 1. AuthorHouse. p. 109. ^ Chakravarti, Sitansu (1991). Hinduism, a way of life. Motilal Banarsidass Publ. p. 71. ^ "Polytheism". Encyclopædia Britannica. Encyclopædia Britannica Online. 2007. Retrieved 2007-07-05. ^ Pattanaik, Devdutt (2002). The man who was a woman and other queer tales of Hindu lore. Routledge. p. 38. ^ a b "Census of India – Socio-cultural aspects". Censusindia.gov.in. Retrieved 2011-02-03. ^ Hefner, RW (2000). Civil Islam: Muslims and Democratization in Indonesia. Princeton University Press. pp. xviii. ^ "CIA Factbook: India". CIA Factbook. Retrieved 2007-05-27. ^ a b c "Religion in India". Religion, webindia123.com. Suni Systems (P) Ltd. Retrieved 2007-04-18. ^ "Census of India 2001: Data on Religion". Office of the Registrar General, India. Retrieved 2007-12-31. ^ a b International Religious Freedom Report 2003. By the United States Department of State. Retrieved on April 19, 2007. ^ "Shia women too can initiate divorce". ^ "Talaq rights proposed for Shia women". Daily News and Analysis, www.dnaindia.com. 5 November 2006. Retrieved 2010-06-21. ^ "India Third in Global Muslim Population". Twocircles.net. Retrieved 2010-07-03. ^ "NSC NETWORK – Early references about the Apostolate of Saint Thomas in India, Records about the Indian tradition, Saint Thomas Christians & Statements by Indian Statesmen". Nasrani.net. Retrieved 2011-02-03. ^ Bose, Ashish et al. (2004-12-04). "Growth of the Parsi population in India". Mumbai: Government of India: National Commission for Minorities. p. 3. ^ "The Bahá'ís of India". bahaindia.org. National Spiritual Assembly of the Bahá'ís of India. Retrieved 2007-04-18. 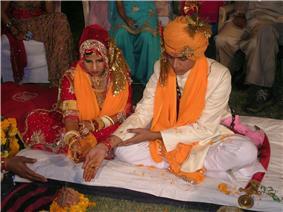 ^ Premsingh, Manika; Jagannathan, R (17 May 2011). "Hindu population set to fall below 80 percent in Census 2011". ^ Evans, Robert (12 February 2004). "Atheists, Humanists Push Campaign for 'Darwin Day'". ^ Lavakare, Arvind (21 May 2002). "Where's the Uniform Civil Code?". rediff.com (Rediff.com India Limited). Retrieved 2007-04-19. ^ Bakshi, P M (1996). Constitution Of India. Universal Law Publishing Co.P Ltd. p. 41. ^ Diwan, Paras (1981). Modern Hindu law: codified and uncodified. Allahabad Law Agency. Retrieved 15 July 2010. ^ "Among Wealthy Nations ... U.S. Stands Alone in its Embrace of Religion". The Pew Research Center for the People and the Press. 19 December 2002. Retrieved 2007-06-03. ^ "Religious Life". Religions of India. Global Peace Works. Archived from the original on March 1, 2005. Retrieved 2007-04-19. ^ a b c d "Domestic Worship". Country Studies. The Library of Congress. September 1995. Retrieved 2007-04-19. ^ Chishti S, Jacob J (1 December 2006). "Sachar nails madrasa myth: Only 4% of Muslim kids go there". ^ Thakrar, Raju (22 April 2007). "Japanese warm to real curries and more". ^ Charlton 2004, p. 91. ^ Yadav, Yogendra; Sanjay Kumar (August 14, 2006). "The food habits of a nation". hinduonnet.com (The Hindu). Retrieved 2007-04-21. ^ a b "Life-Cycle Rituals". Country Studies: India. The Library of Congress. September 1995. Retrieved 2007-04-19. ^ Banerjee, Suresh Chandra. "Shraddha". ^ a b c d e "Islamic Traditions in South Asia". Country Studies: India. The Library of Congress. September 1995. Retrieved 2007-04-19. ^ a b Hassan 1920, pp. 110–111. ^ a b Walunjkar, pp. 285–287. ^ Government of Maharashtra 1962. ^ "In His Service: A Newsletter From Meherabad". June 2011. Myrtle Beach: Sheriar Press. p. 4. ^ "Constitution doesn’t permit forced conversions: Naqvi" (– Scholar search). BJP Today 15 (9). May 1–15, 2006. Archived from the original on September 21, 2007. Retrieved 2007-04-20. ^ Times News Network (25 March 2002). "'"Togadia wants parties to stop 'vote bank politics. indiatimes.com (Times Internet Limited). Retrieved 2007-04-20. ^ "BJP protests in campaign CD row". BBC News. 9 April 2007. Retrieved 2007-05-27. ^ "BJP’s true colours exposed once again". People's Democracy (Communist Party of India (Marxist)). 15 April 2007. Retrieved 2007-05-27. ^ Chadha M (5 December 2006). "Despair of the discriminated Dalits". BBC News. Retrieved 2007-06-03. ^ Giridharadas A (22 April 2006). "Turning point in India's caste war". International Herald Tribune. Retrieved 2007-06-03. ^ a b Mukherjee M, Mukherjee A (December 2001). "Communalisation of education: the history textbook controversy" (PDF). Delhi Historians' Group. Retrieved 2007-06-03. ^ Bureau of Democracy, Human Rights, and Labour (November 8, 2005). "International Religious Freedom Report 2005". 2005 Report on International Religious Freedom. U.S. State Department. Retrieved 2007-06-03. ^ Upadhyay R (21 August 2001). "The politics of education in India: the need for a national debate". South Asia Analysis Group. Archived from the original on December 17, 2005. Retrieved 2007-06-03. ^ Upadhyay R (26 February 2000). "Opposition in India: in search of genuine issues". South Asia Analysis Group. Archived from the original on December 17, 2005. Retrieved 2007-06-03. ^ Punja, Shobita (2010). "Teaching Comparative Religions in India Through Heritages". ATLA No 2 (Material Religion 6): 158. ^ Punja, Shobita (2010). "Teaching Comparative Religions in India Through Heritages". ATLA No 2 (Material Religion 6): 156–165. ^ Shepard 1987, pp. 45–46. ^ Nichols, B (2003). "The Politics of Assassination: Case Studies and Analysis" (PDF). Australasian Political Studies Association Conference. ^ a b Mukhoty, Gobinda; Kothari, Rajni (1984). "Who are the Guilty ?". ^ Watch/Asia, Human Rights; (U.S.), Physicians for Human Rights (May 1994). Dead silence: the legacy of human rights abuses in Punjab. Human Rights Watch. p. 10. ^ "1984 riots were 'Sikh genocide': Akal Takht – Hindustan Times". Hindustan Times. July 14, 2010. Retrieved 17 July 2010. ^ a b Human Rights Watch 2006, p. 265. ^ Smita Narula (April 2002). We Have No Orders To Save You" – State Participation and Complicity in Communal Violence in Gujarat""". Human Rights Watch. Retrieved 4 February 2011. , "Mob used bulldozer to raze heritage mosque". Indian Express. 13 March 2002. Retrieved 4 February 2011. ^ Sanjay Pandey (28 April 2002). "More fall prey to police firings in Gujarat". Times of India (India). Retrieved 4 February 2011. Charlton, Sue Ellen M (2004). Comparing Asian Politics: India, China, and Japan. Westview Press. Chatterjee, S; Datta, D (1984). "An Introduction to Indian Philosophy" (8th ed.). Fowler, Jeaneane D (1997). Hinduism: Beliefs and Practices. Sussex Academic Press. Goldman, RP (2007). The Ramayana of Valmiki: An Epic of Ancient India. Princeton University Press. Heehs, P (2002). Indian Religions: A Historical Reader of Spiritual Expression and Experience. New York: New York University Press. Human Rights Watch; Press, Seven Stories (2006). Human Rights Watch World Report 2006. Seven Stories Press. Ludden, David E (1996). Contesting the Nation: Religion, Community, and the Politics of Democracy in India. University of Pennsylvania Press. Makkar, SPS (1993). Law, Social Change and Communal Harmony. ABS Publications. Oberlies, T (1998). "Die Religion des Rgveda". Wien. Olson, James Stuart; Shadle, Robert (1996). Historical Dictionary of the British Empire. Greenwood Press. Rinehart, R (2004). Contemporary Hinduism: Ritual, Culture, and Practice. ABC-Clio. Shepard, Mark (1987). Gandhi Today: A Report on Mahatma Gandhi's Successors. Shepard Publications. Symonds, R (1950). "The Making of Pakistan". "History of Religions in India". www.indohistory.com. Retrieved 2008-01-01. "Census of India 2001: Data on religion" (PDF). Government of India (Office of the Registrar General). Retrieved 2007-05-28. "International Religious Freedom Report 2006: India". United States Department of State. Retrieved 2007-05-28.